Here’s an update from two of our teammates who are networking with refugee relief workers in and around Athens, Greece in order for us to be better able to serve there. Today we spent all of our time in a Park. The need there is tremendous! The majority of refugees are from Afghanistan and Algeria. Most are hoping to catch a bus to Macedonia despite the fact that the Macedonian border is closed. A Danish reporter informed me that Denmark and Sweden have also closed their borders. 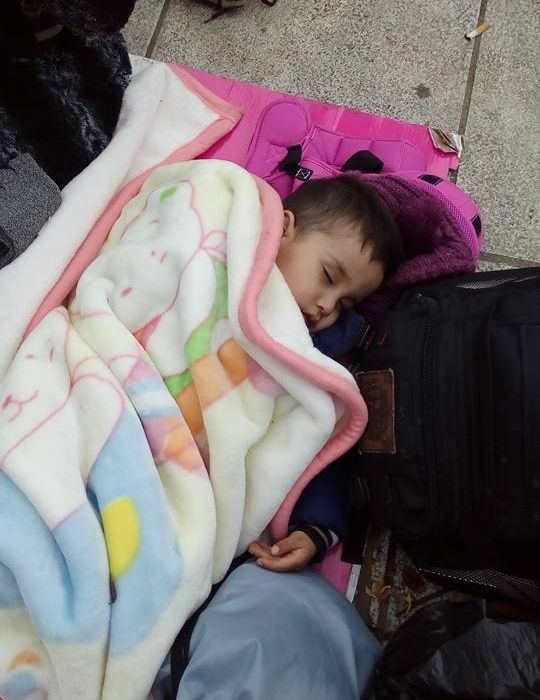 The refugees in the park sleep on the ground in the cold and rain as tents are prohibited by the authorities. They are in desperate need of diapers, clothes, shoes, jackets, socks, and blankets. There are smaller organizations from Sweden, Holland and Germany handing out hot tea and sandwiches while local Greek groups prepare hot meals for dinner such as spaghetti and bread. Locals also come around during the day with apples and sweet bread. A Chinese group handed out shoes and heavy jackets to the young men today. Nanna was a crucial help with interpreting from Farsi for the Afghani refugees. We both assisted with interpretation from Arabic for the Algerian refugees. Then we went around the park introducing ourselves to the refugees and making a list of their needs. We purchased a sleeping bag for a lady with a small child. Also, socks, pants and baby clothes for 3 mothers and their infants and small children. We also helped a young Afghan mother to take her infant to the doctor. The baby was vomiting and feverish. She had located a health center but it was closed. I found a wonderful, helpful shop owner who was happy to help us with purchasing items from his shop at steeply low prices. A local Greek group then asked us to help organize the lines and distribution of the spaghetti dinner. It went very well. The distribution of sandwiches by the Swedish group was a little chaotic but manageable. We helped as much as we could. There are also 20 small local Greek organizations serving battered women refugees and orphans. They are all in need of volunteers! In the Park, Squares and Hospital, there is much need for keeping the children occupied and entertained and assisting the mothers with infant care. I was also thinking that we could connect with a local Greek non-profit legal aid clinic to hold small sessions in the Park to help the refugees understand international law and their options. The refugees we spoke with would test out their English and smile. We were informed that the government had issued 200 hotel vouchers to Syrian refugees granted political asylum in France. The government reopened a hotel for this purpose. Currently, there is no service being done there. 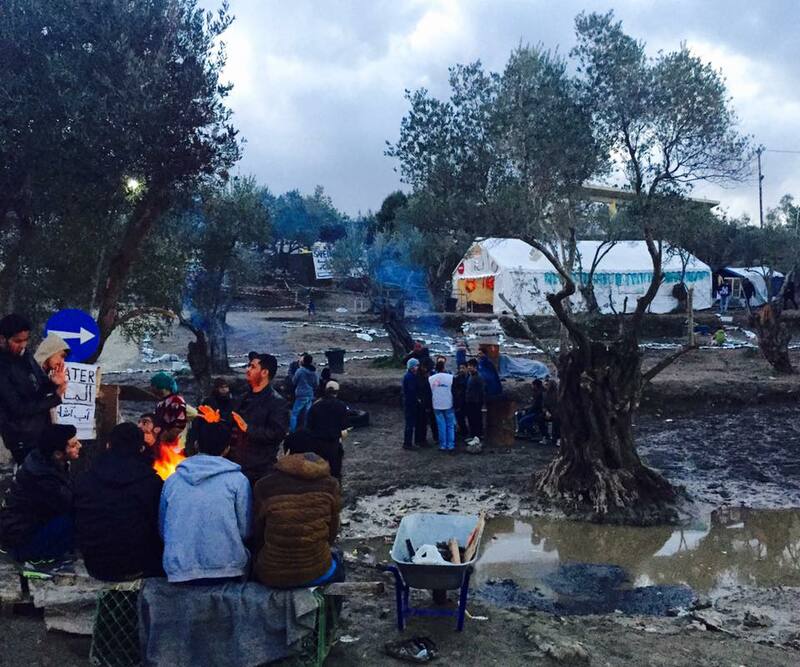 The government will be opening another refugee camp on an old army base. It would have heated tents and accommodate 150 people. We’ll keep our ears to the ground as to when it opens. We visited another refugee camp. It is made up of trailers and is strictly for families. The refugee population comes from Syria, Lebanon, Afghanistan and West Africa. They have a small medical clinic on the premises, a large tent play space for the kids and a small storage unit with clothing donations. The Greek army delivers meals daily to the camp. They have plenty of volunteers that come daily to help with the kids. They asked for our help with clothing distribution and cleaning the camp. We arrived on the island and by the time we checked in to our room, it was 6 pm. The apartments are large but FREEZING. We have a small heating unit for the bedroom but it takes a long time to warm the room and the walls are not insulated. Also, the internet is very week so I am sending these messages and uploading pictures from the cafeteria. Lastly, there is no hot water. We shower in cold water. It is this way in all of the apartments, churches and facilities. The village facilities are simply not prepared for this volume of guests in the winter. No boats came in last night because Turkey had turned on the four massive headlights, which were paid for by the EU, to help crackdown on smugglers. The lights were on the water all night so the smugglers were scared of getting caught and didn’t cross over. Nevertheless, boats came in during the morning hours. As we were leaving a dingy carrying an Afghani family came through and another carrying a Greek gypsy family. I helped get their diapers and medicine, which had fallen in the water, to them. The volunteers that took the shift after us, starting at 7:30 am, said about 231 refugees from Afghanistan and Syria came in after we left. Overall, the overnight shift wasn’t bad and helped me to better understand the circumstances and procedures on the island. This first week has been a good time of learning, serving, and connecting with people. There will be many ways for our short term teams to come and help.